Back in college, I was not fond of philosophy and often cut class. One day, I showed up and it was test time. Essay test time. So I pulled out my mental shovel and piled it on and aced the test. Perhaps if we had started with theories of knowledge and presuppositions, I would have appreciated such things more. It took people like Jason Lisle and Greg Bahnsen to prompt my thinking in such areas. 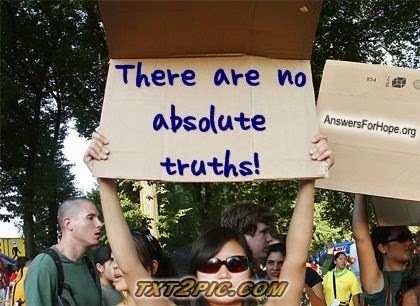 Are there absolutes? How do you know what you know? What is your epistemology? Can we know things? How can we know anything? If we can't know things, then why can't we know them? We all have our starting points and use basic logic (such as the Law of Contradiction). Atheistic worldviews tend to be arbitrary and self-refuting in nature. Skepticism (the philosophy, not the modern stripped-down definition), Empiricism, Scientism, Rationalism and more are irrational and inconsistent. We all have our ultimate starting points for our worldviews. The biblical Christian worldview is consistent, and has the necessary preconditions of intelligibility. Jason Petersen of Answers for Hope discusses these matters in this 54-minute video presentation. A recommendation for people like me who play lectures at accelerated speed: Don't. The microphone is not close to Jason, and he talks at a decent speed anyway, so speeding it up may not be worth it.